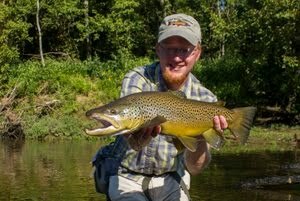 This week featured some very good guide trips. 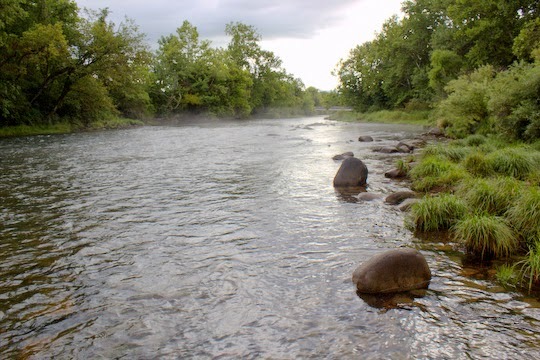 On Monday it was a float down the Caney Fork that produced some very good fishing. We eventually lost count of how many fish we boated on the half day float which is always a good sign. Tuesday was a full day wade trip in the Smokies. Fishing hard on a stream that I've been on several times this summer (both guiding and fishing for myself), my client landed not one but two of the largest rainbows I've seen out of this stream all year. Both were colored superbly as well which is always a special treat. Needless to say, I'm excited to see fall looming on the horizon finally. Today as I drove home, I noticed that the sun angle was noticeably farther south in the western sky. In less than a month, it will officially be fall. That means cooler water, happy trout, and fired up brown trout. Streamers will be working better over the next few months. Anglers willing to fish streamers hard out of the boat may be rewarded with their largest fish of the year. 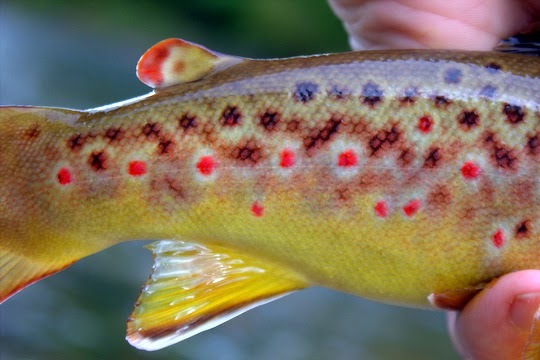 Fishermen in the Smokies will find that the brookies and brown trout are already starting to color up as we head towards the fall spawn. Currently, I'm booking trips in September and October. The calendar will fill quickly so if you are planning on booking a trip, don't wait too long or else someone will beat you to your preferred day. For that matter they may already have. 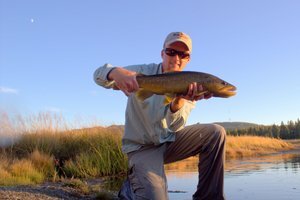 Over the years, I've had so many people make observations about the fish pictures I take. "How do you get the fish to hold still?" is one of the most common questions I hear. Generally, you have to have the camera ready very quickly after lifting the fish out of the water. Have your buddy compose the shot first and take the picture as soon as the fish is in place (there's a reason a lot of the best pictures have water dripping off the fish). Snap 2-3 very quickly and one will usually turn out. Then get that fish back in the water ASAP. Done correctly, a fish should never be out of the water more than 10 seconds and even that is on the long side. Ideally this is done with two people of course. If you have to take self timer shots, get a BIG net and keep that fish in the water until the last possible moment. The last thing you want to do is kill a fish that you intend to release. And now for the whole point of this post, I wanted to make sure you all realize that not all fish are cooperative, I thought I would share a favorite brookie shot I just came across from a couple of years ago. Actually, I have a whole collection of these "action" shots. Maybe I'll do an expanded post showing them another time and you can all laugh at my (and other anglers') facial expressions as I realize the fish is headed somewhere else. For now, here is one of many anti-picture brook trout. 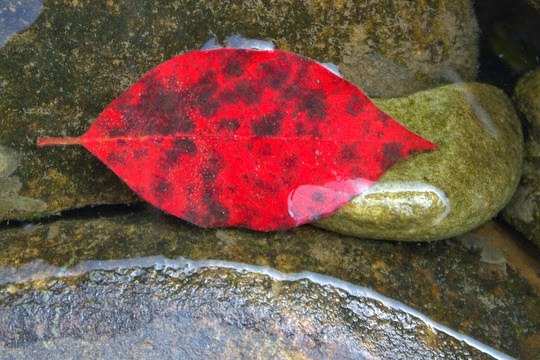 At least the colors are still beautiful! First I want to make mention of a big event coming up in November of this year. Yes, I do know that it coincides with some great fishing, but what better way to kick of the cold months of tying "season" than at Fly Tyer's Weekend? This year, Little River Outfitters is bringing back an old favorite and is working closely with Tremont Lodge and Resort to put on this big event. Some of the best tyers in the southeast and even in the country will be there to demonstrate techniques and flies. Tremont Lodge in Townsend is newly renovated and will be a fantastic place to enjoy this big event. If you enjoy tying or are thinking about learning, this is a can't miss opportunity. Okay, now that I've got a little of the excitement out of my system, I'm happy to further mention that I'll be tying on Sunday, November 9. If you are planning on visiting and have some specific patterns you would like to see, please let me know. I guess I better start figuring out what I would like to tie as it will be here before we know it! While messing around trying to come up with a brown trout catching machine, it occurred to me that I have quite a few good flies that I've designed including some that are go-to guide flies. At what point do you start actually thinking up names for these monstrosities? Take the streamer above, for example. To begin with, there is nothing even close to a guarantee it will catch fish at this point so we don't have to worry too much yet. But, for the sake of letting our imaginations run wild, what in the world would you call this thing? Deer hair head, saddle hackle tail with buck tail and marabou for the wing. I even snuck in a few rubber legs and some variegated chenille. Hopefully the trout won't care that it doesn't have a name. 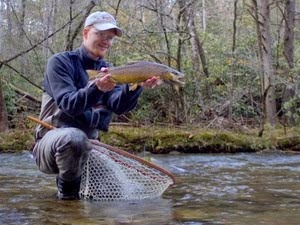 On my recent trip to upper east Tennessee, I fished the South Holston and Watauga rivers as well as a high elevation freestone stream. Of the three streams I fished, the Watauga was the easiest by far. 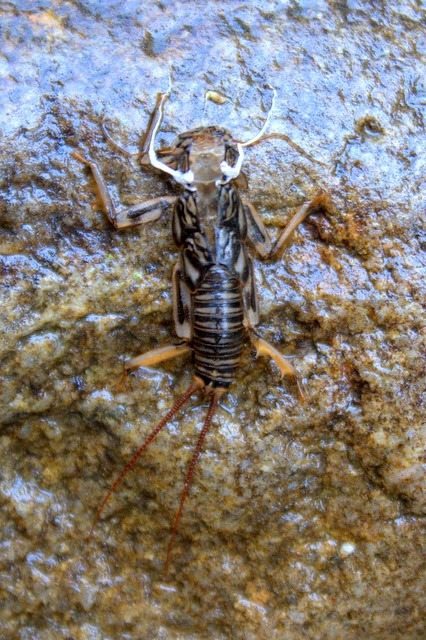 The fish are less sophisticated than on the South Holston and would eat most any nymph I drifted through their living room. 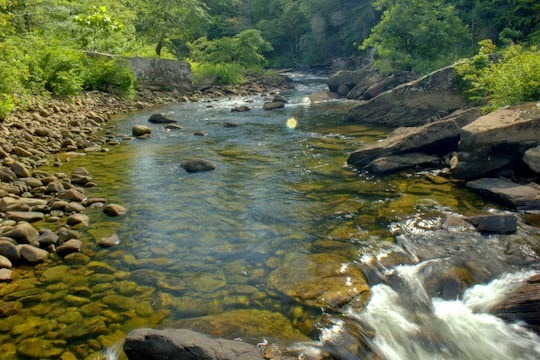 I only fished the Watauga for a few hours in the morning but probably caught 30 or 40 trout during that time. None were large but all were in great shape. 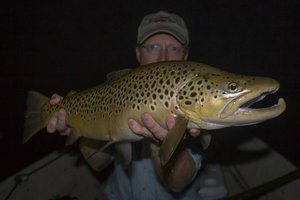 Some of the browns I caught looked like they were wild. For that matter some of the rainbows did as well although I'm not sure how many wild rainbows are in that river. Once the clouds started to break and the sun peaked through, the fishing tapered off a bit but was still very solid. The only downside of this trip is that now I'm wishing I lived closer to these fine streams so I could fish them more often. 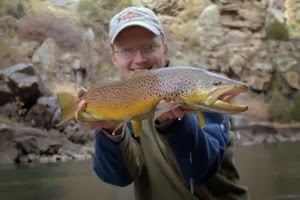 Here is one of the browns I caught on the Watauga that is a strong candidate for prettiest fish I've caught this year. Just look at those spots!!! Most off days lately have resulted in some great exploration. 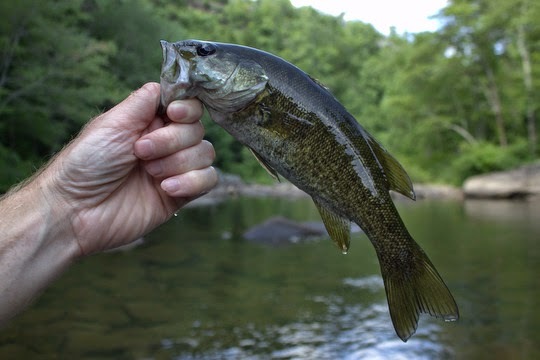 The Cumberland Plateau area is blessed with more great water than one could reasonably expect to fish in a lifetime although that isn't keeping me from trying. 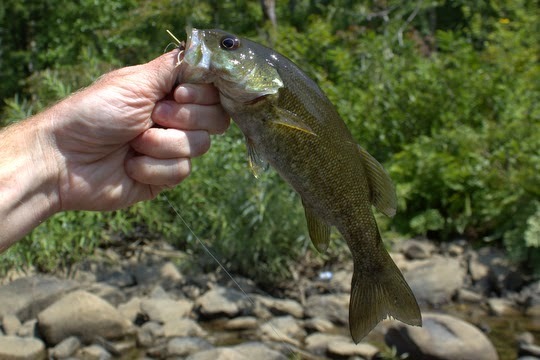 The local smallmouth are eager to hit surface bugs which is probably part of the draw. Here are a couple from last week. The stream has a fairly decent flow for this time of year although we could still use a little rain. One of the things I'm noticing more and more as I look for good shots with the camera is that fall is on its way. Yes, I know some of you don't want to hear about that yet. 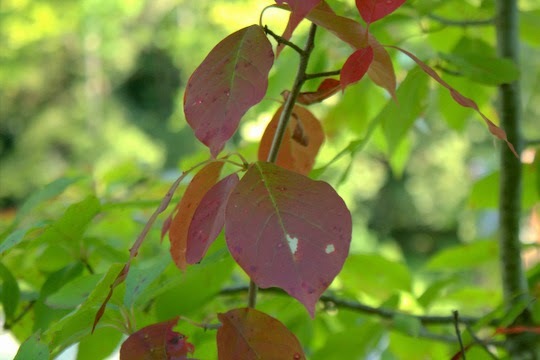 Seriously though, there are colorful leaves everywhere I look. Fall is coming soon!